The Stunt People will be exhibiting at the Southern California Martial Arts Convention (SCMA) on October 11 – 12 in Del Mar, CA. 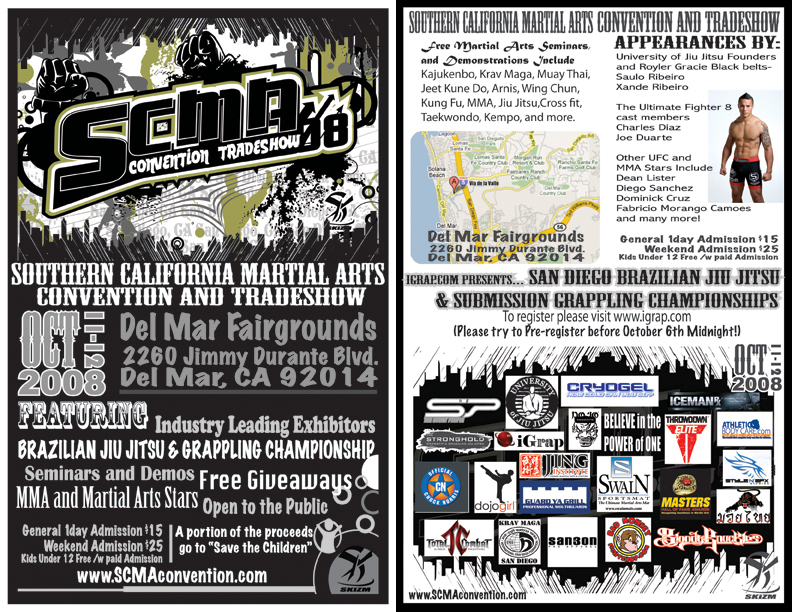 “For the first time ever, enthusiasts from all disciplines including Kung Fu, Karate, Muay Thai, Jiu-Jitsu, and MMA now have an event in Southern California to call their own in this jam packed two day event.” Click the flier below for more information! Micah Brock’s short film “Johnny Owes”, featuring Dennis Ruel of The Stunt People, recently won the Action on Film Festival’s “Best Fight Choreography (short)” award. Micah’s hard-hitting style of choreography is reminiscent of Tony Jaa’s in “Ong Bak” and “The Protector” and undoubtedly made an impact on the judges when they handed down their decisions. The small-res version is embedded below, but Brock recommends the high definition download since it was shot in HD. If you side step over to Tiger Claw Foundation.org you’ll see that Ed Kahana and Brandon Daranouvongs have made the front page for volunteering their time in the Glide Martial Arts for Kids Workshop (Gallery) organized by Janeen Lee of the Capture the Dream Foundation. If you or someone you know would like to organize a community event, please contact us at stuntpeople at yahoo dot com. On March 21, Ed Kahana, Pete Lee, and Brandon Daranouvongs hosted the Glide Martial Arts for Kids Workshop. Click below for the full gallery of photos.